A population of 9 billion people. Lack of land and water. How could there possibly be enough food for everyone in the near future? Aren’t there limits to straining our current conventional way of farming? Yes, there are. Is there a radical, disruptive innovation that can give us a sustainable alternative? Thank goodness, yes, there is. Is it possible to conceive an agriculture that is up to 50 times more efficient? An agriculture without pesticides and which uses only 10% of the water conventional agriculture needs? With plants that taste much better and never catch a disease? Sounds like science fiction? Then science fiction is already here today. We do have the technologies to enable this 21st century version of the Garden of Eden. The type of agriculture we are talking about, comes by different names: indoor farming, urban agriculture or vertical farming. But, what’s in a name? Where’s the real revolution? In the late 80’s two companies, in two different parts of the world, took on to the same idea. Plant physiologists of both the Japanese company Mirai (meaning The Future) and the Dutch company PlantLab, understood that plants, in general, do not grow to their full potential. And that’s quite an understatement. All plants evolved in time to be able to survive in harsh natural conditions: heat, cold, heavy rain, winds, blistering sun… Traditional agriculture soften these conditions by growing crops in controlled environments, such as green houses. A giant step and much better for the plants, of course, which results in bigger yields. Artificial lighting further advanced this growth process by giving plants light during the night. Now take another giant step. Think like a plant! What would you really need, if you were a plant? What would you need for your optimal growth? This fundamentally different question led to a very new perspective of our common understanding of agriculture. The sunny Earth may seem like paradise to us (at least: most days, hopefully), but it is a dreadful place for plants. More than 20 years of research reveal that each plant has its own ‘software’, its own optimal parameters to thrive (temperature, O2, CO2, light, water, nutrients…). One of the astonishing results is that plants actually don’t need sunlight to grow, especially green light which they reflect. On the other hand: plants do love blue and red light, with a little bit op far infra-red light for the heat. Thanks to the remarkable advancements in LED technology, we are able to expose plants to exactly the light they need. Glowing LEDs for growing crops. LED lighting has very compelling advantages: it gives the exact color and intensity of light the plants needs, at a fraction of the power consumption high intensity discharge (HID) lamps currently burn away in greenhouses. The results are wondrous. The lighting revolution now enables us to grow affordable high quality food anywhere (your basement will do), anytime of the day, without diseases and without using pesticides. All in all, the LED revolution leads to a much more efficient way of farming, near where you live. Forget about lengthy and fuel absorbing transportation. Excellent news for farming, but also for foodies: the ‘software’ of each plant can be tweaked for a remarkable, much better taste end product. Sounds like organic farming? Well, it isn’t. This is a whole new type of farming. Whereas organic farming still uses pesticides (yes, it does! ), this type of farming does not. To be 100% correct: organic farming uses pesticides if considered natural, which excludes synthetic pesticides, GMO treatments and antibiotics. Another very different feature is that organic farming requires more – not less – acreage than traditional agriculture, due to lower yields. A song for the deaf? There’s a huge difference between ‘can do’ and actually doing. So, is this revolution really happening? Is it more than a song for the deaf? Yes. The world is moving towards this new type of agriculture. Several companies, from plant physiologists to LED systems manufacturers, from universities to large electronic companies, are focused on this development. 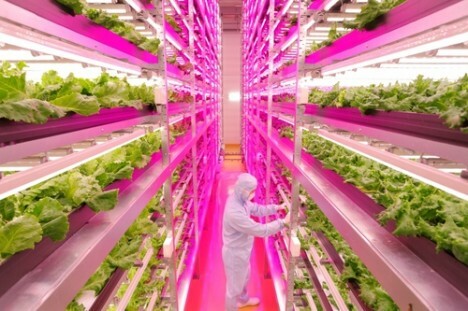 In Japan, after the Fukushima disaster, Toshiba and Fujitsu allocated their old clean rooms to indoor farming. In Singapore, Panasonic is supplying fresh vegetables for this land-scarce city-state. In China, the cities are assigning entire floors under the parking lot in new buildings for controlled environment farming. In Korea, you can already buy in-supermarket-grown food. MIT has recently launched the Open Agriculture project, providing an open source platform where everybody can share and discuss their findings, aiming at providing a sustainable future for agriculture, for all of us. Earth’s population may continue to grow, there is a way of feeding us all. And isn’t it beautiful: it can be done in a sustainable and affordable way. The LED driven agriculture can be done anywhere, anytime. Consuming up to 50 times less land. With 90 percent less water. With 0 pesticides and 0 diseases. And isn’t it tasteful: the crops prove to be much more delicious. So LED there be enough and healthy food for everyone. With thanks to Dirk Remmerie for his contribution to this article.